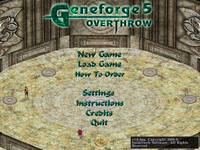 Spiderweb Software brings you Geneforge 5: Overthrow, the final chapter in their fantasy epic. Return to the world of the Shapers one final time. Explore a vast, war-torn world, create and mold your own army of strange, powerful monsters, and choose a side to help lead to final victory.